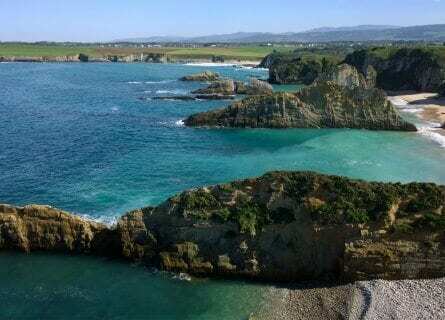 Asturias is a gem of a region, situated in the north-west of Spain between Galicia and Cantabria. Often overlooked as a gourmet tourist destination, somewhat in the shadow of neighboring Galicia, yet this natural paradise has everything to offer. We have designed this luxury, gourmet tour of Asturias to include the best of the region’s cuisine from authentic, traditional offerings to outstanding Michelin starred haunts. All in one of the most breathtakingly beautiful parts of Northern Spain. The tour includes visits to cheese farms, “Sidra” Spanish Cider tastings, Michelin starred dining, a stay in a gorgeous Countryside Manor House, you can take in the stunning coastline from the water as you cruise along by yacht, gaze up at the striking mountains from some of the cutest coves and beaches and relax and absorb the culture with the welcoming locals. 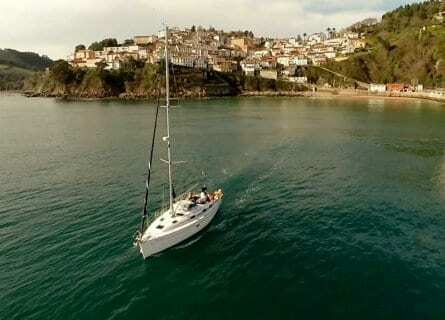 From either Asturias, Santander or Bilbao airport you will be collected by luxury Mercedes and swept away to Cudillero, to the Hotel Restaurant Mariño in the Concha Artedo for a welcome lunch overlooking the sea. You will then have time to explore this quaint seaside village and the stunning coastline around Cadavedo, before settling into your delightful inn in Navia. Over the following days, you will see some of the most amazing scenery in nearby villages, seaside hamlets, and countryside, feast on local delicacies, enjoy cheese and “Sidra” tastings and enjoy a private cruise. If you are looking for a relaxing tour full of fine food and drink combined with stunning scenery, then contact us for more information on this superb tour. Arrive at Asturias, Santander or Bilbao airport. Your elegant chauffeur will pick you up and transfer you by luxury Mercedes to the gorgeous coastal village Cudillero for a welcome lunch overlooking the sea at the Mariño Restaurant at Concha Artedo. Here the focus is on fresh fish and seafood, the lobster rice is divine. But there is also a selection of locally sourced meat and game, prepared to perfection. After lunch, you will undoubtedly appreciate a digestive walk and the opportunity to stretch your legs. You can enjoy some free time to explore colorful Cudillero and the stunning coastline around Cadavedo. Then when you are ready your chauffeur will drive you to your delightful, nautical themed inn, Hotel Pleamar in Navia. Settle in and enjoy a free evening with our recommendations. After a leisurely breakfast, your chauffeur will collect you at about 10 a.m. for a morning to explore local areas Tapia de Casariego, Coaña and Taramundi. Tapia is a quaint port with a pretty lighthouse. Depending on the time of year you visit you might coincide with the Mussel Festival or in autumn months see the waves leap the breakwater of the harbor. Moving onto Coaña; here there are a number of historical sites to explore such as the “Castro de Coaña” or Mohias Palace and Santa María de Cartavio Church. Moving further inland, Taramundi is a picturesque town in the middle of the mountains. There is a fascinating Knife Museum here, producing handmade knives which seem to hold their sharpness for forever! Taramundi is also full of the cute “Teitos” which are old thatched roofed huts used to protect farmers and their livestock from the elements. After all of this sightseeing, you will most likely be famished. Lunch today is at the wonderful Los Arandanos restaurant, this is an amazing treat, as the stunning location, top service, and exquisite cuisine combine to make this an unforgettable dining experience. After lunch, you can ask your driver to stop where you wish for some further sightseeing and picture opportunities, before being returned to your charming inn for an evening to yourselves. After your delightful breakfast, check out and at about 10:30 a.m. your chauffeur will be ready to collect you for a short 40-minute drive to the amazing Rey Silo craft cheese farm. Steeped in history and tradition, here you will enjoy a VIP tour and tasting of their mouthwatering cheeses. Just enough to get your taste buds going, as next, you will be moving onto the beautiful seaside town of Salinas, where the Michelin starred restaurant Real Balneario is located. Here you can savor local Asturian produce prepared in the most original and tantalizing way. Such delights may include Hake Cocochas and clams in a green fennel pilpil sauce, Asturian Fabada stew with compango (meat trimmings), Red Tuna Tataki on fried rice breaded in panko and served with glazed vegetables or Suckling pig on a bed of grilled vegetables, finishing with something sweet such as Chocolate soufflé with carrot ice cream, all accompanied with carefully selected wines. Once back in your comfortable Mercedes you can sit back and enjoy the views as your driver takes you onto your next destination, Coya, where you will be staying in the gorgeous Countryside manor House, Casona del Viajante. Learn all about Spanish “Sidra” today! Enjoy a leisurely breakfast and at about 10:30 a.m. your driver will collect you for a short 30-minute drive to the first cider house of the day; Castañón. 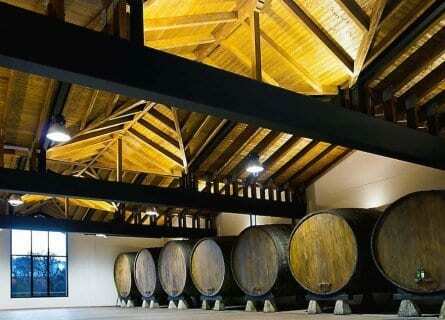 Here you will have a private tour followed by a tasting. Then move onto to the second cider house visit, El Gaitero, this, in contrast, is one of the oldest and is steeped with history. Here, again you will be treated to a private tour and tasting. By now you will undoubtedly be famished; your chauffeur will drive you just a few miles down the road to yet another cider house, the delightful Sidra Cortina, set in the most beautiful gardens where a delicious lunch will be served. Here you will enjoy typical dishes prepared with locally sourced products all washed down with their scrumptious cider of course. After a late lunch, you can relax and take in the scenic drive back to your countryside manor house, Casona del Viajante. The evening is yours to make the most of your hotel or explore locally with our recommendations. At the time to suit you, your chauffeur will drive you to the fantastic lookout “Mirador del Fitu”, an amazing way to start the day with the most sublime views of the coast and mountains. Depending on how energetic you are feeling, there is a great, easy level hike from here, with the most rewarding views. It takes about half an hour or an hour according to the route you choose. Next a 20-minute meander up the coast to Lastres, one of Northern Spain’s most beautiful villages, a chocolate box postcard perfect hamlet. Explore the cobblestoned streets and delicious views of the sea, peeking out at every turn. Spain’s version of Doc Martin, Doctor Mateo, was filmed here. Lunch is next and it’s a seafood blow out at Eutimio. Here fresh fish and seafood are king, all carefully selected by the chef each morning. The mixed seafood platter is amazing! After lunch board your private boat for a 2-hour cruise along this stunning coastline. After a magical day head back to your darling inn, Casona del Viajante. Today is all about beautiful mountain scenery, lakes, and memorable cuisine. At 10 a.m. your chauffeur will collect you and you will head towards the “Picos de Europa” and your first destination is the Sanctuary of Covadonga and the glacier lakes of Enol and Ercina. The views from here are breathtaking, and when you reach Ercina you have climbed over 1000 meters. 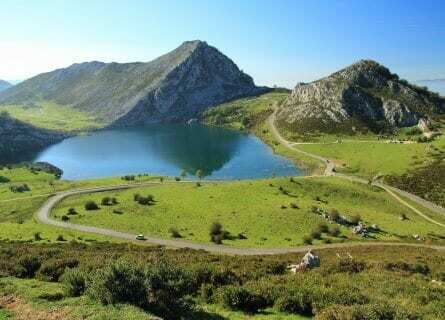 The most visited tourist destination in Asturias, and there is no doubt as to why! Carry on to the bustling market town of Cangas de Onis which is a great stop for charming souvenirs – especially typical Asturian cheeses or cider. Lunch then is a 2 to 3-hour affair- refined tasting menu in the hills outside of the adventure hub of Arriondas, in a delightful rural setting at Casa Marcial. This two Michelin starred eatery is a real gastronomic treat! After lunch head to the coast of Llanes, and settle into your pretty lodge, Arpa de Hierba in a leafy neighborhood of Llanes. Enjoy a relaxing afternoon and evening in this picturesque town. Cheese, please! Taste the signature cheese of Asturias today, Cabrales, at a family run “queseria” (cheese farm) Queseria Main, set at the peak of the mountaintop village of Sotres. At 11 a.m. your driver will collect you and take you to this divine cheese farm. Visit their traditional cheese cave, located a scenic 20 minute walk into the mountains and follow with a tasting of course, of their cheeses. Start with the young, white, fresh cheese with no aging followed by an older blue and finishing with a fabulously honking aged blue. Wash it down with traditional cider, naturally and you might like to pick up some gourmet goodies from the little gift shop. After a great morning, sit down to lunch in Sotres in a humble, authentic mountain lodge and taste classic dishes like Fabada, Pote, Cachopo, Rice pudding. You will be pleasantly stuffed and can enjoy a digestive walk down the road in the cute tiny hamlet of Tielve. Enjoy the panoramic drive back to the coast, stopping in gourmet shops in the mountain hamlets on the way if you wish to pick up artisan cheeses, local liqueurs or pretty pots of honey. A free evening in Llanes, you might like to try out the local “tapas”. 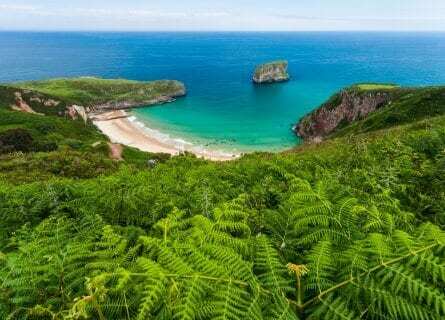 Today we have planned time to get to know gorgeous Llanes. Llanes is a quaint fishing village with neat boutiques and upmarket souvenir shops, and also a beautiful province with 30 spectacular beaches. They can be enjoyed in all seasons and there are terrific walks with views of limestone cliffs and the gentle Sierra de Cuera Mountains. You can easily fit in 3 beaches before lunch and depending on your preferences- walking/ swimming/ snorkeling, we can select the best beaches for you. Personal favorites are Cuevas de Mar and Pria for walking, Barro and Poo for swimming, Cue for snorkeling and Ballota and Andrin for dramatic views and crystal clear, turquoise water. Lunch is something completely different today- creative cuisine at the Michelin starred Retiro. As well as the most amazing sensual discoveries prepared here, the dishes are pure art on a plate! 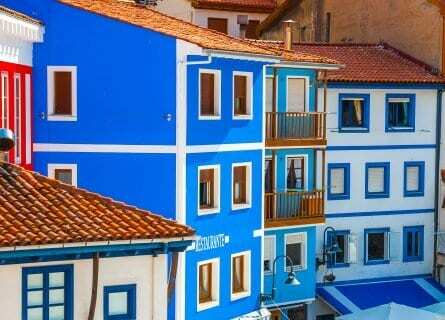 A free afternoon follows to potter around Llanes, get in some shopping or relax at one of the beaches right in the village like Sablon or Toro. Then enjoy your last evening in this very special part of the world. Enjoy a hearty breakfast at your cozy inn and then at the time to suit you your chauffeur will collect you and transfer you back to Santander, Asturias or Bilbao airport for your journey home. We hope you had an unforgettable time in our favorite region of Spain, Asturias!